R&S®VENICE VIEW, the new multiviewer from Rohde & Schwarz is the perfect addition to the R&S®VENICE product line. 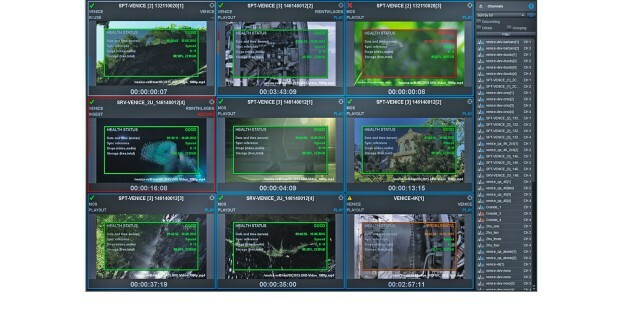 R&S®VENICE VIEW uses a sophisticated IP-based software architecture that makes costly conventional SDI infrastructure and dedicated multiviewer hardware obsolete. R&S®VENICE VIEW allows you to monitor all R&S®VENICE channels in the network, irrespective of their resolution. In addition to the video image, you see the channel name, channel status, time code information and audio peak meter. R&S®VENICE VIEW additionally provides comprehensive information about the current status of every channel. Visual signaling provides you with information about current memory usage, system time, synchronization and any drops that might occur . R&S®VENICE VIEW can be licensed on any number of client systems, making it possible to monitor all R&S®VENICE channels in the network, independent of user or location. This opens up a large field of application in production, master control and system IT.